I read about this competition just recently and thought Hmmm why not! The weather conditions were ( and still are) terrible, lights were bad, camera not behaving. When going gets tough, the tough gets going…. So I decided to submit this entry anyway. It has everything I love to eat; both flavour and texture wise. 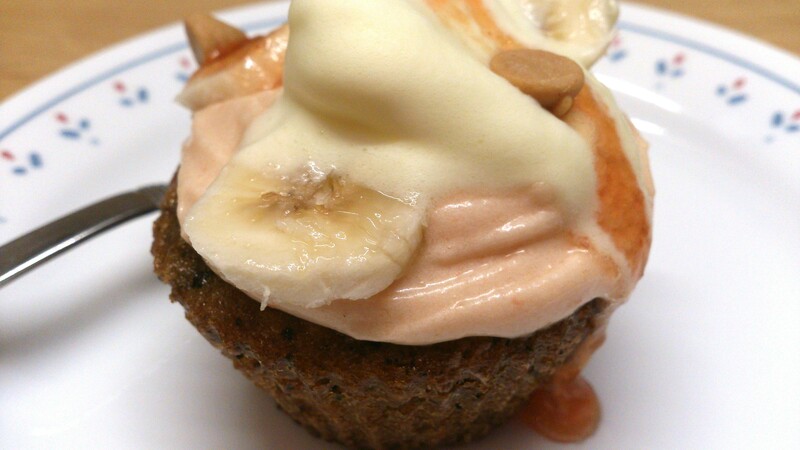 It is a banana espresso with peanut butter chip cupcake, topped with jam frosting and simple vanilla ice cream. See the melting ice cream? We don’t have temperature controlled homes/kitchen in Pakistan and it was bound to happen. 1 1/2 cups mashed bananas, use very ripe ones. Preheat oven to 350 F or 180 C. Line a muffin tin with paper liners. Combine banana, sugar, brown sugar, butter, egg, mascarpone cheese and milk in a medium mixing bowl and stir well. In another medium bowl whisk together flour, espresso powder, baking soda and salt. Pour the banana mixture into the flour mixture and stir to combine. Fold in the peanut butter chips. Fill the lined cups about 3 quarters full. Bake in the centre of the oven for 20-25 minutes, rotating the pan halfway through the baking time, until a toothpick inserted in the centre of the cupcake comes out clean. Place the pan on a wire rack and remove the cupcakes after 15 minutes. Let cool completely before frosting. For frosting, beat butter with an electric mixer for 10-15 seconds, add sifted icing sugar. Add jam and mix well. Pipe on cool cupcakes, top with a scoop of vanilla ice cream, drizzle some extra jam and garnish with banana slices and some peanut butter chips. Thankyou so much. These are my absolute favorite cupcakes.